Preserve Lemons couldn’t be easier to make; salt and patience’s. With so many uses you’ll want to keep a or two jar in your refrigerator at all times. Lemons preserved in brine mellow out the sharp citrus flavor bringing out the lemon umani. Umani is the Japanese word for the fifth savory taste along with sweet, sour, bitter and salt. Preserve Lemon are an essential ingredient in many Middle Eastern, Asian and North African recipes. I made these for a Moroccan Chicken Tajine recipe I wanted to try out. Since then I have added lemon juice to a tuna salad, added peels to cooked couscous and salads. There are recipes on the internet adding peppercorns, bay leaves and other herbs to the brine. I go for the simple salt and lemon recipe because I might use the lemons in a sweet recipe. I might make 2 jars so, I can play with the flavors for sweet and savory recipes. Traditionally the lemons are cut into quarters, but not all the way through. In my research for recipes I didn’t see any advantage to keeping the lemons. By quartering the lemons, you can get more into a jar. 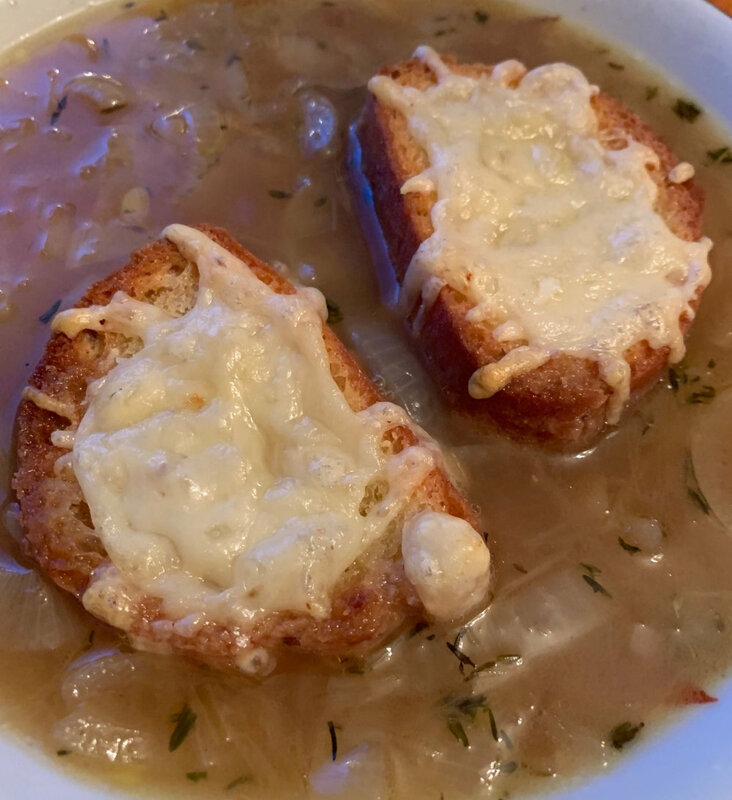 The secret to a rich French onion soup is caramelized onions. 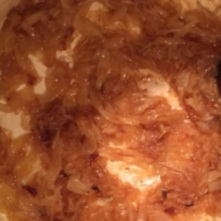 By taking the time to caramelize the onions you will be rewarded with sweet rich brown flavors. 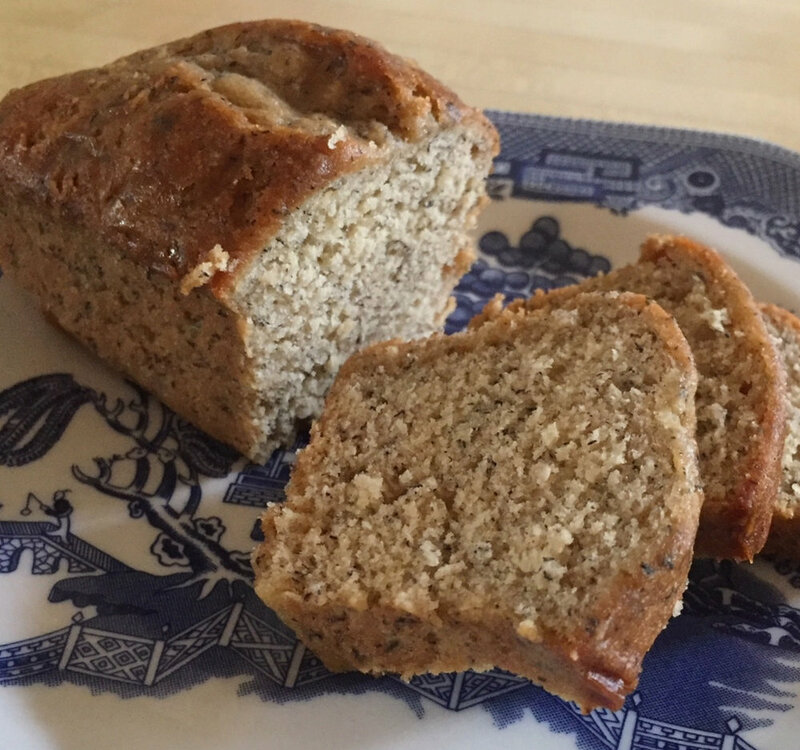 This recipe uses simple ingredients that you probably have in your pantry. Melt the butter in a heavy bottom pan, add onions. Cook on medium-low for about 25 minutes until the onions are soft and translucent. Add the sugar and salt and stir often until are golden brown and caramelized, about 15 minutes. They will be very soft and sticky. Sprinkle the flour over the caramelize onions and cook it for a couple of minutes – or add the slurry. Add sherry, Nutmeg and stock. Bring to a simmer and cook for another 30 minutes. Season with salt and pepper to taste. 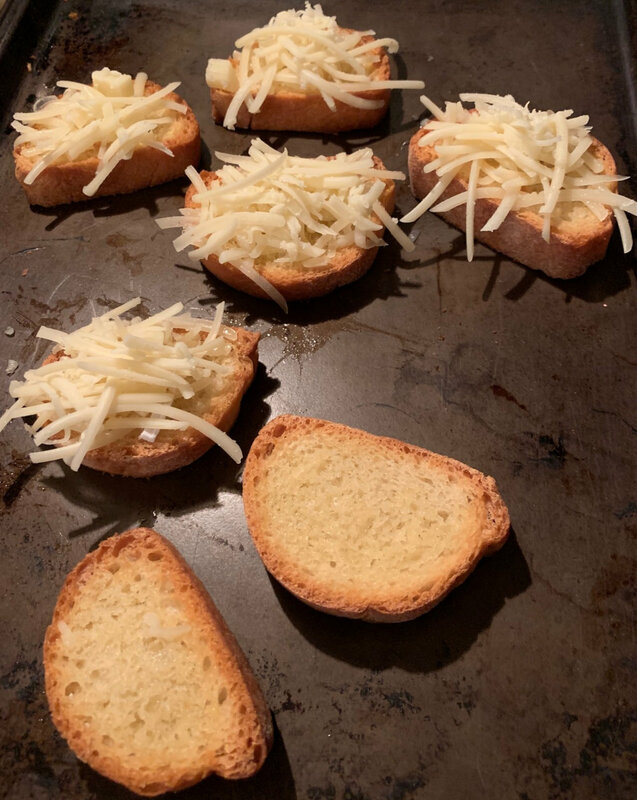 Slice the bread about ½” thick, top with mixture of Parmesan and Gruyere cheese and lightly toast under the broiler then top with cheese and continue to broil until it is bubbling and melted. Remove the bay leaves, ladle the hot soup into bowls, place the bread on top and serve. What makes a pantry essential ? For me, it’s an ingredient that has the capacity to add a lot of flavor, texture and goodness to a variety of dishes. In this blog I am going to share my 5 essential ingredients and give you several recipes you can use to make. 3. Milk - dairy and nut milks -canned, powdered or boxed - I don’t drink milk, but it is an ingredient in many savory and sweet recipes. I keep a stash of both canned and powdered milks in addition to coconut and flax milks. Stock up on the nut milks you prefer. I can make pancakes, gravy, and cream soups and sauces any time without worrying about having fresh milk. Toss cooked carrots with coconut milk and a little curry and you have an exotic creamy side dish. 4. Beans - canned and dried - Canned beans are very convenient. My pantry usually has garbanzo, black eyed, cannelloni and pinto beans. Saute a chopped onion in some good olive oil and add a couple cans of beans add a can of tomatoes with some good New Mexico chili powder and you have Open a Can Chili. (link to the recipe below) To make a Humus dip for chips and veggies just toss a can of garbanzo beans, garlic, lemon juice and Tahini (sesame seed paste ) in the food processor. For another Mediterranean dip use White cannelloni beans, pesto or basil and olive oil. Lentils can be cooked then served as a soup or a salad. 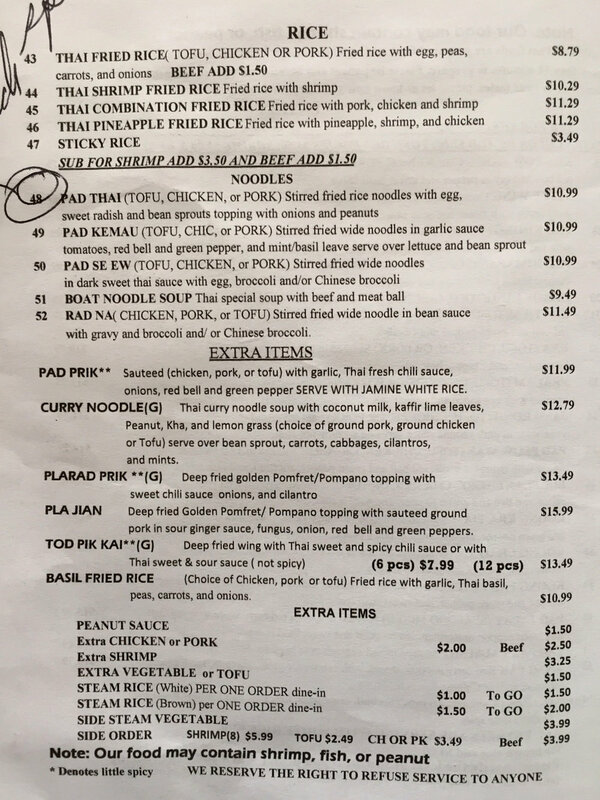 Link here to all The Bill Plate Recipes. 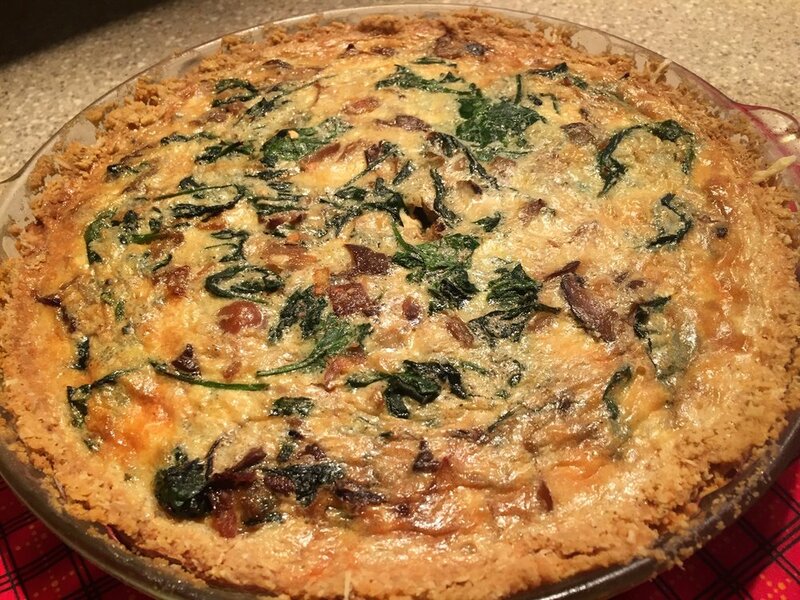 Quiche, a versatile dish - It doesn’t take much time to put together a quiche. Add a green salad and you have a meal. 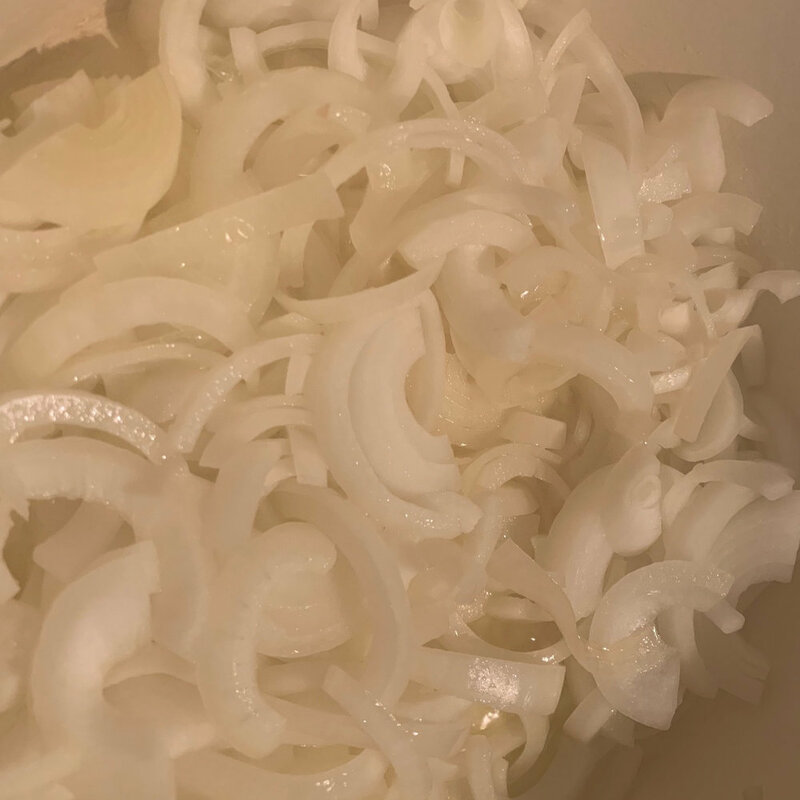 Caramelized Onions - A favorite condiment - Onions be added to salads, burgers, and they are a treat on a grilled cheese sandwich. Mushroom Soup is rich and earthy - Another easy to make soup that is rich in flavor. Open a Can Chile - It can’t be any easier! to make a big pot of chili than sauteing onions and opening a bunch of cans. Add chiles to make it as spicy as you want. Brown ground beef or stew meat can be added or keep it vegetarian. Pico de Gallo - fresh salsa - serve on a steak, with eggs, on tacos and burritos, or with good corn chips. A squirrel’s charming dinner plate along the path. Everybody needs a place to eat; in the forest or a home. I have an old table I bought for all of $10 from Pat Pickering almost 20 years ago. Pat was an artist with wonderful stories of hanging out with Jackson Pollack and artist of that era. She was downsizing and had a garage sale where I scored my table. Pat told me she got the table from Long Island where it was used to iron linens. Pat brought it with her when she move to the West Coast; San Francisco then Point Reyes Station. I move my ‘new’ table into my studio above the Old Western Saloon then brought it with me when I moved back to Mount Shasta in early 2000’s. Every person has an eating routine. Some days it’s breakfast in the car, lunch at your desk and dinner in front of the TV. When my family gathers at the table we just add as many chairs as we need to accommodate the crowd. The food goes on the table Family Style, we put the phones down and the conversations begin. Family Style is casual dinning; all the food platters and bowls are set on the table then passed around with everyone serving themselves. My Millennium grandchildren and friends hang out at the table eating and drinking until all the food is gone. This table is part of the story of my family. We make arts and crafts projects, it’s a desk and the family dinner table. Someone gave me an ironing board so, I don’t iron on the table anymore. Dragonflies are one of the paper crafts I make at the table. Here’s the link to see more of my artworks. 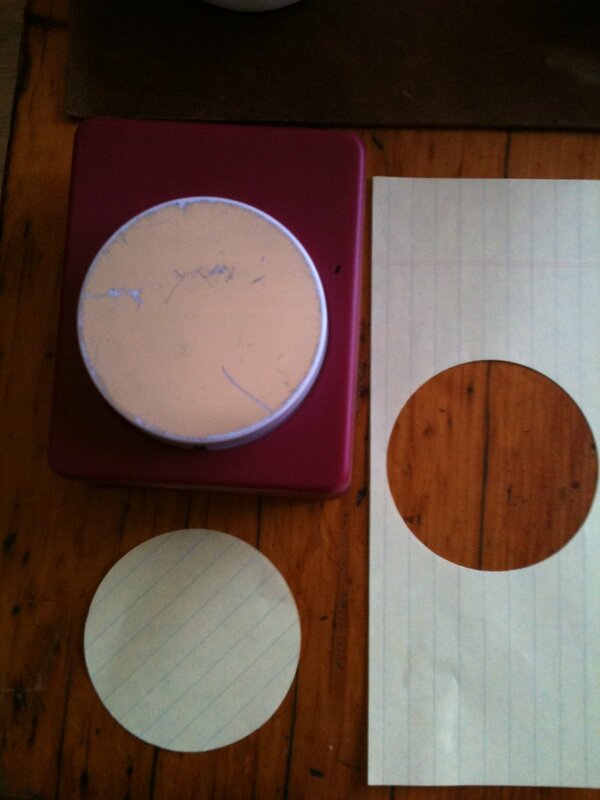 Testing out a large circle cutter at the table. A little Parmesan cheese adds a salty creaminess to the soup. Another family favorite is Lentil Soup…we are all getting tire of being sick and bored of Chicken Soup. Lentils are legumes, Lens ensculenta, coming in yellow, red, green, black and brown colors. The brown and green variety are best for soups and salads because they stay firm; holding their shape after they are cooked. These little seeds come one or two in a pod. They are a good source of iron, potassium and protein. Lentils absorb the flavors from ingredients and seasonings they are cooked with. Lentils can be used in soups and salads. Lentils cook fairly quickly without needing to be soaked. They are a good choice for same-day soup making. Always checked the lentils for small stones and rinse them before cooking. Lentils are among the earliest crops domesticated in the Old World; believed to have originated in central Asia. “Lentil seeds dating back 8000 years have been found at archeological sites in the Middle East. Lentils were mentioned in the Bible both as the item that Jacob traded to Esau for his birthright and as a part of a bread that was made during the Babylonian captivity of the Jewish people.” According to The World’s Healthiest Foods A site managed by the George Mateljan Foundation. This recipe makes a large pot of soup. About 4 quarts. 2 boxes broth – Use what you have vegetable or mushroom stock will keep this a vegan soup. Sauté the onions in oil in a Dutch oven or large heavy bottomed pot until translucent. Add garlic, carrots and herbs and sauté for a few minutes. Add the broth and stir to incorporate any of the bits on the bottom of the pan into the broth. Stir in tomato paste, cabbage and lentils. Season with salt and pepper to taste. On medium heat bring the soup to a boil, reduce the heat and simmer until bean are soft 15 to 45 minutes. 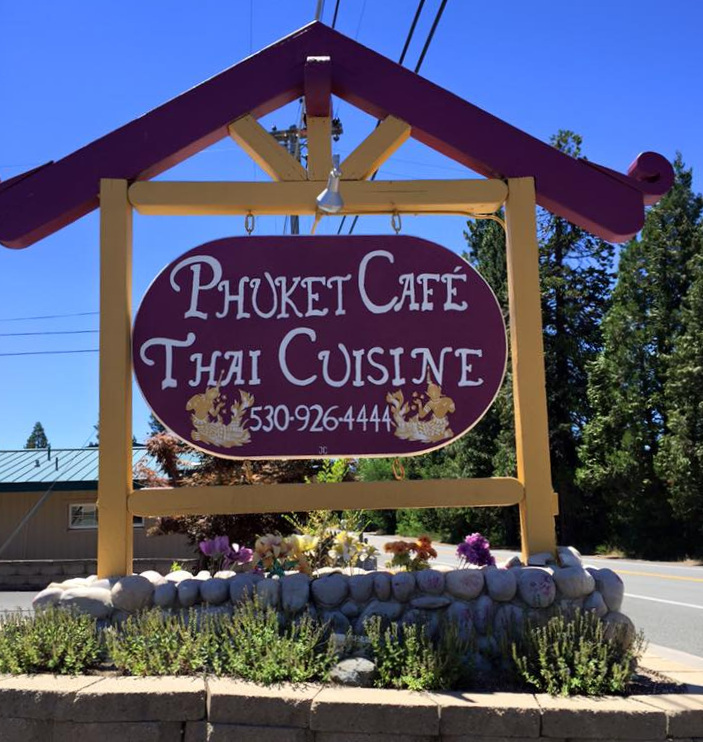 Remove by leaves before serving. Serve warm and garnish with grated Parmesan cheese or parsley. My granddaughter Carly got really sick with a viral infection so, I made her some chicken soup. 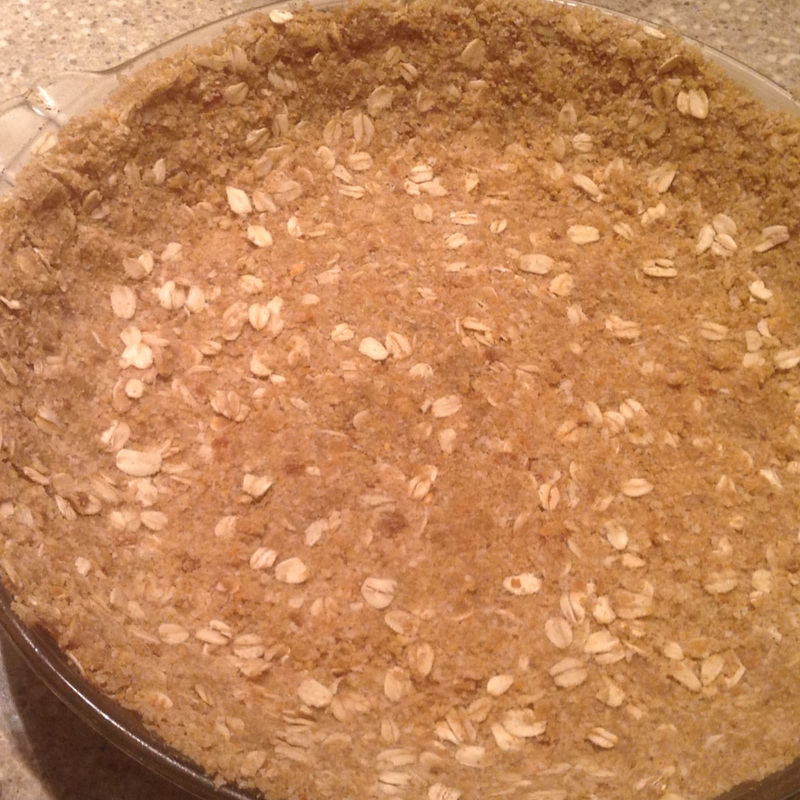 It’s really easy to make and is believed to have healing properties. Even so, a good bowl of homemade soup makes everyone feel better. Below is the basics. I use organic where ever possible. You can add whatever vegetables your family likes and vary the amounts to your taste. 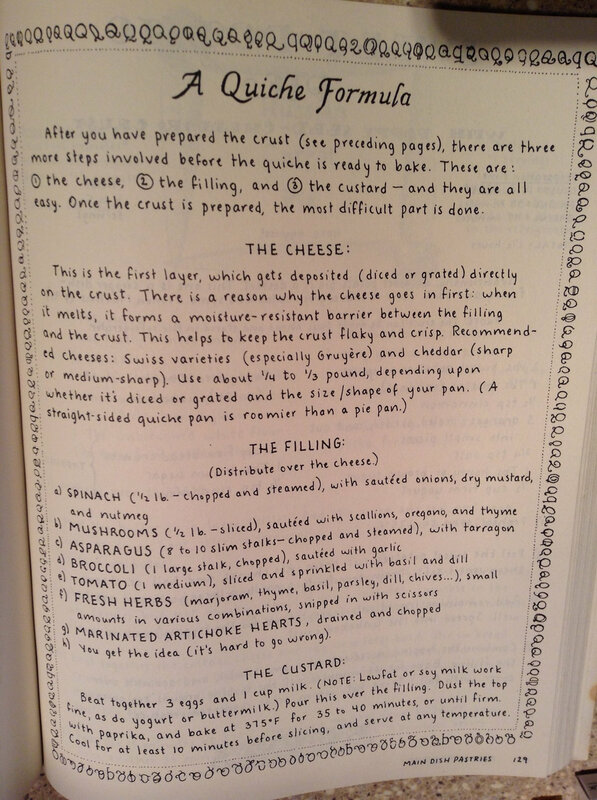 This recipe is more of a guideline. You can replace the starch from the potatoes with barley, rice, noodles or your favorite grain. 4 Stalks Celery – sliced – leaves included- Today I made this without celery, because, while I love celery. Carly...not so much. How I cook chicken: Heat the oil on medium in a heavy bottomed pot/pan. I use a Dutch oven, especially, if I’m going to make soup. Salt and pepper the chicken on both sides. When the is hot put the chicken in the pan skin side up. Let it cook for 12 minutes, then turn it over and cook for another 12 minutes Put a lid on the pan, turn the heat off and let the chicken be for another 12 minutes. For bone-in chicken cook for 15 minutes each side and rest for 15. The chicken should be completely cooked, tender and moist. The trick is not to fuss with the chicken. Leeks add a distinct flavor and texture to any soup and many dishes.